Aikid® dees not fight the force of gravity — it takes advantage of it "Weight underside" is the most efficient approach to a motion as it aligns with the forces of nature, the forces of the universe. In addition, there is the weight of miles of air above us, pressing us down to earth. 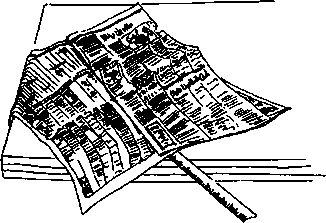 A full-sized sheet of newspaper spread out flat on a table top has 10,000 pounds of air pressing on its surface. strike dn U? SUde a wooden yardstick under a sheet of newspaper; happ^ sharPly on the protruding end of the yardstick and see what • As nage, when causing uke to fall, "gravity is your friend." 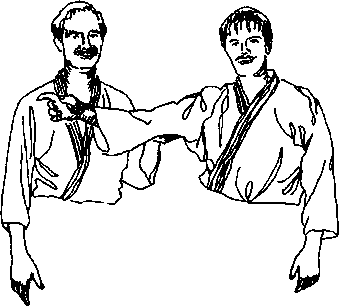 Most Aikido techniques will not work with the shoulders up and elbow held out to the side. In attempting a throw with Weight Upperside uke may not fall down — because you're actually holding him up. 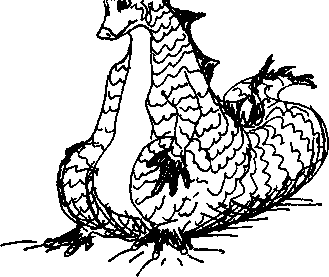 But wh waste energy holding shoulders and elbows against the force of gravid and weight of air9 Align with those forces; drop them. "Dropping weight underside" is allowing your skeleton to support you — that's what it's for — rather than requiring muscles to do things that need not be done anyway. Under stress, we tend to hunch our bodies as if protecting ourselves against an attacker. Shoulders go up and elbows go out, perhaps a primeval device to look bigger than we are. In reality, a hunched body is no protection at all Relax. Check periodically for signs of tension. Is your face tight7 Relax your eyelids Are your shoulders hunched while driving or working at your desk? Drop them1. We may also be disturbed by hunched attitudes — defense mechanisms, often brilliant survival techniques — that served their purpose years ago but are no longer useful, may actually be harmful, and so are no protection either "He's very defensive," said an observant friend of a fiercely tough-guy acquaintance, "and so he is very easily manipulated." For me, another version of Weight Underside came to light with an injury As there always seems to be more to do than can possibly be done, I tend to flit from one crisis to another, lopping the heads off the dandelions of life rather then reaching down to the root. When flitting meant hobbling painfully about on a severely sprained ankle or on crutches, I was astonished to find that I accomplished more-had to stay in one place, finish what I had begun, and follow the cho«® through to the end instead of making do with "a lick and a promise.' my surprise, this did not mean lost time but a product' a series of completed tasks in place of divided attention, wasted energies, and an end e stream of unfinished work and emotional IOUs. 11 £?er the Eight-Direction Exercise, George Simcox Sense/would often roar Greatu Now everybody drop your shoulders by two inches""
^s se€®i»gly simP]e exercise (udemawashi-undo) is the basis of many Ailado throws. 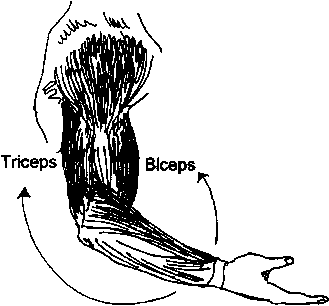 It is the "up" that makes an effective "down," an exercise in raising the arm and dropping it in alignment with gravity, using mass, acceleration, and relaxationin the most effective way possible. Hie same approach underlies sword techniques and other tools from hammers to hoes. These fall of their own weight. They are not forced up then forced down. To do so is tiring and inefficient. Allow the arm to drop, of its own weight, to the lowest point. 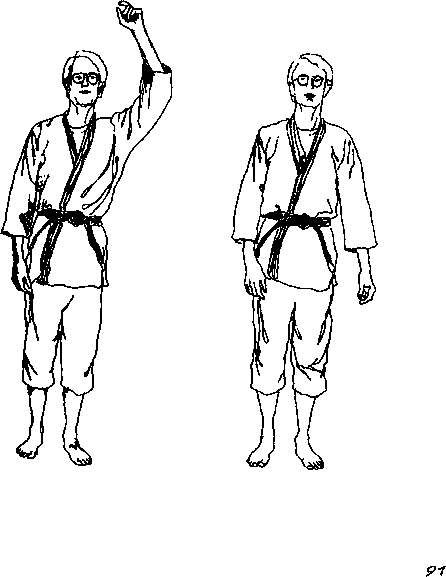 Uke test by attempting to lift straight up on the arm or testing for Unbendbable Arm. Some Aikido techniques require ducking a strike. Which is quicker? 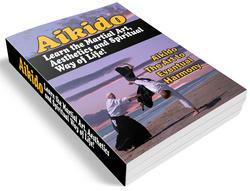 It is one of the paradoxes of Aikido (but good physics) that the most em cient way to drop down is to first go up. There is a striking example on film ofUeshiba performing the sudori throw. In this technique, nage drops down to hands and knees so that uke tumbles over him. But there's more to it than that. Ueshibafirst leaps up into the air, tucking his feet under him, then falls down completely. Consider an hourglass and watch the grains of sand falling down. Imagine that you are the hourglass, warm sand running through the top of your head, streaming through your body. Change the sand grains into individual grains of light. 3- Imagine what light would look like if it were a liquid. 4- Send this warm honey-colored liquid through your body, to drain out through holes in your hands and feet. Uke test. An exercise in doing nothing. Uke gently removes supporting hands. Uke test by lifting up gently behind the elbow. Nage does nothing, changes nothing. If uke wants to lift the arm, he must be allowed to lift all of it — all by himself. Visit an aquarium that has seabirds and an underwater view at feed®8 time. Watch the birds diving, wheeling, soaring —flying through the water. To them there is no difference between the fluid air and the fluid water. One of the lessons of history is that "nothing " is often a good thing to and always a clever thing to say.